The philosophy of art was always one of my favorite classes, as a grad student. One evening, my favorite instructor was talking about the sublime—that quality of utter resplendence that so wholly defeats our capacity to contain it, describe it and formulate it in any way, that we find ourselves awestruck. It is a quality that supersedes language entirely. In art, it is not found by examining the techniques of the artist. Vivaldi can give away his method and his tricks, but still no one will compose like Vivaldi. 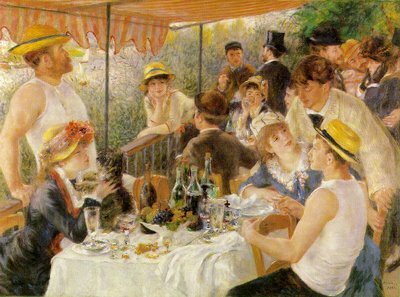 Renoir can explain his brushstrokes and color mixtures and still, all we’ve got is a good copy, which only makes good foodstuff for the philosophers, who can argue about whether a good copy is really art or not. The understanding and the employment of technique can only, ever, take us so far. I was thinking about these things one night when I caught an interview with Jason Alexander, of Seinfeld fame. To the question of whether “technique can make you a good actor,” his reply was to the point: “No, it’ll make you a good technician.” It’ll make you a better actor, to be sure, but there’s a sort of magic to good art. There’s an indefinable something about the truly good artist. Like the sublime, itself, there’s something you can’t explain about it. It’s the “it” factor. There’s a distinctiveness about the great artist that lies outside the qualities that we can enumerate. Every instance of it is unique, like the finger print, every one of which looks the same to an untrained eye. But of all the billions of people that have ever existed and that will ever exist, there will never be two identical prints. Or the voice—each of which has its own resonance and tone. Maybe that’s the key for the philosophers, as to the mystery of the good copy and the problem of calling it art. There is always the suspicion that something is missing. And I would suggest that it’s because the missing component is intangible—it too, is beyond the paint mixtures and brush strokes and techniques. It is creation itself. It is the idea behind it, it is the inspiration to do it and finally, it is the act of unfolding it into reality. You are the universe unfolding, Zen says. The artist unfolds a new reality by expressing the world in her mind’s eye, transcending all the while, her own experience, by revealing the one we share. She affords us a glimpse of our collective experience—she catches the ephemeral, like a dancing butterfly, and puts it to form as a subject for our gazing eye. She is a story teller. And it doesn’t much matter if it’s true, for our remembrance of anything is but a construction, subject entirely, to what we were able to apprehend and comprehend, at the time, to our maturity level, to our attention span and to our mood at the time. And as the future has not yet happened, what we take as true is always a creation in some sense. It is the ineffable creative element that stops us short. It is the sublime. It is the realm of mystery.